In recent years, advancements in modern technology are truly something to behold! From smart phones to hands-free personal assistants, (such as Apple’s Siri or Amazon’s Alexa) clearly we as people, have come a long way from the days of throwing stones! As this title wave of technological advancements continues to sweep the globe, we find all sorts of different aspects in our lives transformed in astounding new ways! While many professions have been affected by the boom in modern technology in varying degrees, there are few professions that have seen more advancements and significant improvements than that of professional dentistry. With numerous new ways to repair damaged teeth, check for diseases such as oral cancer, or create flawless replacements for missing teeth, keeping up with the consistent influx of new technology can certainly be a challenge for today’s dentists. However, perhaps one of the hottest new brands of cosmetic dental technology has hit the market just recently, and has quickly become a fan-favorite among practitioners and patients alike. Considered the number one highest rated teeth whitening system by practitioners nationwide, the Guided Light Optic technology or “GLO” as it’s commonly known, is a cutting-edge new innovation that has taken dentistry by storm, and many patients smile in the process! As you can probably imagine, cosmetic dentistry has increasingly become one of the most sought-after dental services in the world today. In an era of daily social media postings, instant access through smart phones, tablets, and of course selfies galore, people today obviously want their smile to look good! In order to meet this demand, basic tooth whitening trays were created and put on the market to provide people with the means to whiten and improve their smile within the convenience and comfort of their own home. The Glo Pro Teeth Whitening System is a method not entirely unlike the use of standard whitening trays; however, as developed through advanced technology and expertise, Glo Pro’s performance can be considered far superior to that of its predecessor. Originally created and developed by the visionary power couple Dr. Jonathan and Stacy Levine, Glo Pro science is the unique brainchild of two separate professions collaborating to achieve one common goal; a safe and effective way to achieve a beautiful smile. Highly accomplished in both dentistry and prosthodontics, Dr. Levine sought to create a better alternative to the cumbersome and often problematic convenience store whitening products. Enlisting the help of his wife Stacy, (a fifteen-year professional in the beauty retail industry) Dr. Levine created a one of a kind system that has changed the process of whitening teeth in unbelievable ways. Available exclusively at Overland Park Dentistry and other select dental offices throughout the U.S. the Glo Pro Teeth Whitening Kit consists of a Glo-illuminating mouthpiece, the attachable replacement control, as well as a charging dock, a travel case, and the g—vial refill accessory. By simply charging up the controller, applying the whitening gel to both top and bottom rows teeth, and then placing the blue illuminated mouthpiece in your mouth for a total of eight minutes, you will be well on your way towards a smile at least 5 shades whiter and brighter than before! And … You can Whiten On The GO! As mentioned previously, over the counter, take home tooth whitening trays have been available for purchase at local pharmacies and convenience stores across the country for many years. Although relatively cheap and easy to obtain, these simplistic and moderately-priced whitening trays were not without their drawbacks and therefore are not typically recommended by the majority of dentists. However as recognized by individuals such as Dr. Jonathan and Stacy Levine, the desire for patients to whiten their teeth at their convenience, without having to come in for an appointment every single time, was a genuine concern. And that’s what led to the invention of the Glo Pro Teeth Whitening System. In addition to providing a happy medium to satisfy both dentists and patients, the Glo Pro science also eliminated some of the hazards and short comings associated with the over the counter whitening trays of the past. These given drawbacks in addition to the general inconvenience, have often caused consumers to seek out a more professional whitening treatment, to which (and sometimes at the recommendation of their dentist) the Glo Pro Teeth Whitening system is absolutely ideal. 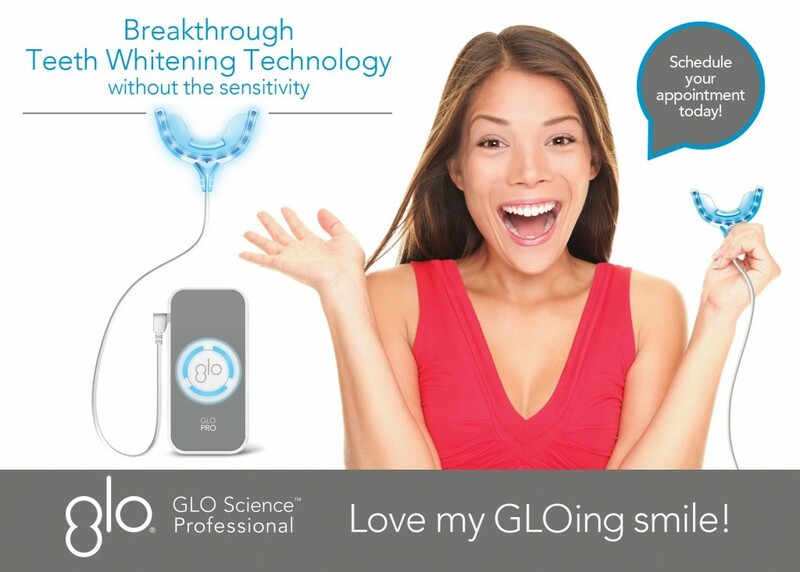 Glo Pro Teeth Whitening: Smile Bright This Holiday Season! As we enter the holiday season, we find ourselves at a time of year where there’s certainly plenty to smile about! Therefore, in the spirit of the holidays, Overland Park Dentistry will be offering our own in-office whitening special for only $425 (Valued at $631) allowing you to super charge your bright smile experience with the new Glo Pro Teeth Whitening technology that will give you a whiter smile On The GO! Remember ’tis the season to be jolly, and with the sleek new Glo Pro Whitening System, now you can smile brighter than ever! Dr. Charles R. Kimes, DDS and his expert team at Overland Park Dentistry look forward to having the opportunity to care for you and your family with any preventative, restorative or cosmetic needs you or your family may have. To schedule your dental appointment and Glo Pro Teeth Whitening experience, contact us at our south Overland Park office at (913) 647-8700 or our north Overland Park office at (913) 341-2380.